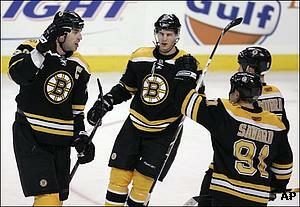 The struggling Boston Bruins are no doubt glad to see the Tampa Bay Lightning coming to town. The Bruins look to get back on track and continue their home dominance of the Lightning when the teams meet Thursday. Boston (36-26-8) has dropped five of its last six games, including Tuesday's 4-1 defeat in Ottawa. The Bruins have had problems offensively over that span, managing two or fewer goals in each contest. Still, Boston has managed to earn four points during the slide, losing once in overtime and once in a shootout along with the win. "We're kind of struggling to score goals, but before this game we got three out of four points, so it was pretty good before this game," rookie David Krejci said. "We've got to bear down and try to score on our chances. I think we played pretty good until they scored two goals. We had some good chances early on but we just can't score. We need to bury those opportunities." A visit from Tampa Bay (27-35-8) could certainly help Boston shake its slump. The Bruins are 20-2-0 with six ties all-time at home against the Lightning, and have scored at least four goals in each of the last six meetings in Boston. Overall, Boston has won 10 of 12 against Tampa Bay, which owns the worst record in the Eastern Conference. In order to extend their dominance in the series, though, the Bruins may have to get their power play going. They've scored just three goals with the man advantage in 37 chances over their last seven games. Defenseman Zdeno Chara, who leads the team with nine power-play goals, has missed the last two games because of injury. Chara has 16 goals and 32 assists on the season. "Everything we got from the results (points to) a day-to-day situation. General soreness," coach Claude Julien told the Bruins' official Web site before Tuesday's game. "It's an upper-torso injury, but we'll just leave it at ... that's all it is." Alex Auld has started the last three games in net for Boston, allowing just four goals on 83 shots. He's 2-1-0 with a 3.35 goals-against average in three career starts against the Lightning, while No. 1 goalie Tim Thomas is 4-2-0 with a 3.02 GAA in six games against them. The Lightning have dropped 10 of their last 12 games, but set a season high for goals in Tuesday's 8-4 win over the New York Islanders. Vincent Lecavalier scored three times and Michel Ouellet had two goals for Tampa Bay. "It's a great win," Lecavalier told the Lightning's Web site. "It's good for our confidence, and we're happy. Everybody was making plays, making some nice passes. It was an overall good game." The result moved coach John Tortorella past Bob Johnson to become the winningest American-born NHL coach with 235 victories. Tortorella left after the game without speaking to reporters due a personal matter. "I think it was certainly satisfying for our players," assistant coach Mike Sullivan said. "We've worked extremely hard over the past six or seven or eight games, maybe even longer, and haven't got rewarded."